My applique cupcake pattern – now free via Scribd as a thank you to all of of you– see the link on sidebar of my blog. I’d appreciate any folks who could add a Quilted Cupcake link to your blog or lists. Please feel free to link to the free pattern, and use the photo below on your site. The Machine Apron I created with Heidi Grace’s Cucpake Fabric – so handy to have scissors, etc. readily available at my machine. I made the pattern up as I went along. Behold – The Frosting Shot!!! 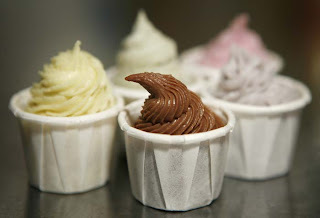 The elusive Frosting Shot – the Associated Press did a whole story on these babies – here’s a link to Dallas Morning News story. Prepare to drool. Bakerella – she just posted adorable snowman pops! Red Velvet Art – Sweet Tooth Embroidery Pattern only $3! Cupcake Stamps – these are the crafting cupcakes from www.tayloredexpressions.com, so cute, I can’t stand it! Do you have any cupcake recipes, crafts or collections to share? Please let us know in the comments! 4 Responses to "Episode 21 Show Notes: The Cupcake Show"
I think I gained 5 pounds listening to your podcast – just kidding. I was looking through my blog reader this morning and on Make they found a 100 cupcake game blog post. Amazing – you HAVE to check it out. Great timing on their part too! Frosting shots??? Oh my. Where can I get one? In Australia we call them patty cakes traditionally although more and more people are calling them cup cakes …. which I resist wholeheartedly. My mum used to make a famous 1 2 3 4 cake. 1 cup of butter, 2 cups of sugar, 3 cups of flour and 4 eggs (plus enough milk to make it the right consistency and whatever flavouring you choose) She would make slab cakes, round cakes and patty cakes from this mixture. With 8 kids she needed to make things in bulk. She would hardly get a chance to ice them as we would love to eat them hot!